Any parent who has undertaken the relatively tedious task of visiting the local hardware store on a mission to top up the kids’ sandpit knows that a 20kg bag of sand weighs … well, 20kg and that means more than a bit of back-bending to get it on to the shopping trolley. Multiply that by an average sandpit top-up of six bags and you might wish you had done a few more weights down at the gym. Or maybe you are a do-it-yourselfer ready to lay a set of pavers or a patio. It takes a lot of patience, a lot of shovelling, and a lot of wheelbarrowing to shift a single cubic metre of sand dumped unceremoniously in your driveway by the landscape supplier’s delivery truck. So spare a thought for a project that has relied for its very success on just a tad more sand – like another 10,999,999 cubic metres. No, this is not a misplaced feature from Dubai Landscaper’s Monthly. Instead, it is just one of the mind-boggling statistics behind the largest aviation project in Australia: the construction of a parallel runway at Brisbane’s International Airport. The eight-year project at a total cost of up to $1.3 billion is at the leading edge of a decade-long, $3.8 billion pattern of transformation that has seen Brisbane (BNE) consolidate its position as the third busiest airport in Australia – and with ambition to further match it with its southern key gateway counterparts in Sydney and Melbourne. Once fully operational in 2020, the runway will effectively double BNE’s current capacity, drawing comparisons with Singapore’s Changi and Hong Kong International. Combined with the attraction of Queensland as a prime visitor destination, it is a compelling story that BNE’s parent, the Brisbane Airport Corporation, is eagerly taking to the world. VIDEO – This May 2015 corporate video looks at the completion of Stage 1 of the runway project. The traffic foundations are already in place with its two major terminals offering services to around 22 million passengers a year. And in a possible sign of things to come, BNE has seen a recent upsurge in connections through Chinese operators such as China Eastern, China Airlines and Hainan Airlines, including an inaugural Air China, Brisbane-Beijing service from December. The fastest-growing airport in Australia now caters to 32 airlines flying to around 70 national and 29 international destinations with freight handling (import and export FY16-17) of more than 112,000 tonnes. The next step is foundations of a very different kind. Anyone occupying a window seat as their flight completes a circuit over the blue waters of Moreton Bay to line up with Brisbane’s runway 19 can’t miss the massive swathe of white off to the right of the terminal infrastructure and almost touching the tip of cross runway 14. 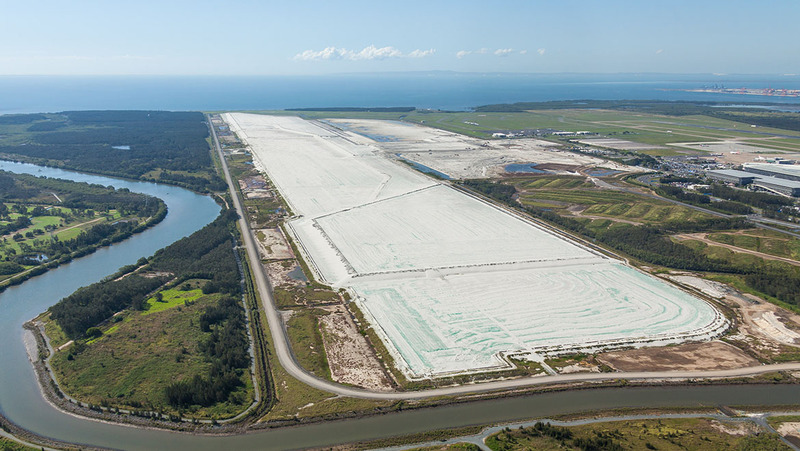 That’s what millions of cubic metres of sand looks like – representing the reclamation of more than 360 hectares of boggy marshland, covered largely in casuarina scrub, to deliver a runway 3,300 metres long and 60 metres wide and with an associated 12 kilometres of taxiways (the current main 01/19 runway is 3,560 x 45 metres). 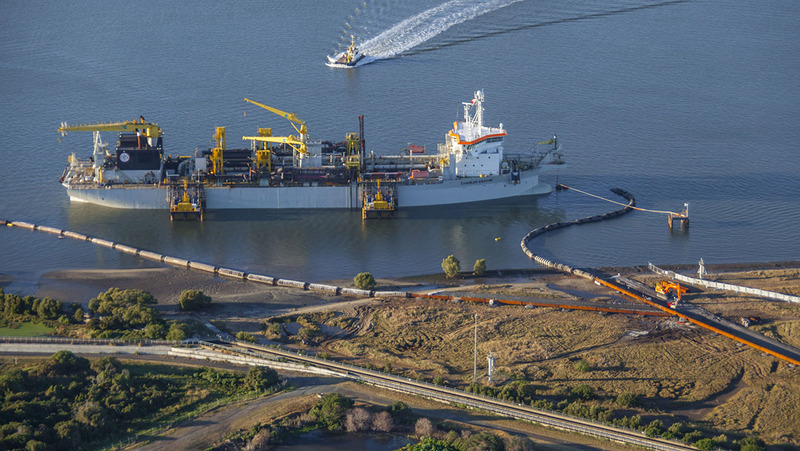 The very nature of the land, a former river delta, lying low and abutting Moreton Bay, has presented a huge logistical challenge and is the key reason why the project has an eight-year timeline. This has never been a case of speedy land clearing and grading before laying asphalt and concrete, but rather a complex geotechnical project reliant on compression modelling. In layperson’s terms, the question was this: how much material would be required to compress and consolidate the poor quality soil structure to provide a sufficiently strong platform to support the new runway system? Hence the magic 11 million cubic metres, supplemented by the driving down of no fewer than 333,000 wick drains, specially configured vertical drains, to further draw away water to assist the consolidation process. Inclusive of the initial project set‑up and subsequent land clearing, it has taken about five years to reach the current project stage of a platform strong enough to herald the start of construction of the runway proper. 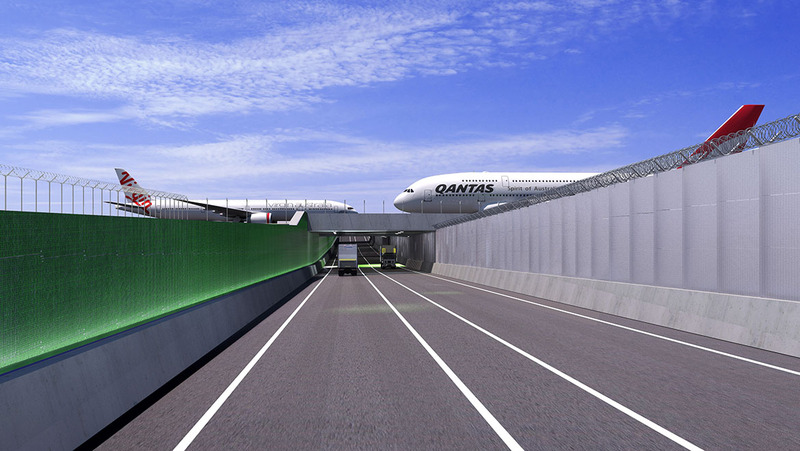 In the meantime, work is underway on a key allied project, the delivery of a vehicle underpass beneath taxiways that will link the new runway system to the existing system and terminals. It will be built to carry an aircraft design weight of 710 tonnes, or – as parallel runway project director Paul Coughlan puts it – “an A380 plus 20 per cent”. As an indication of the depth of research involved in planning the taxiway weight-bearing capacity, the project team examined the development of major aircraft by type over a 20 to 30‑year period, from base model to stretched versions. In almost all cases the final stretched version of an aircraft type added 20 per cent to the MTOW of the original – hence a projection based on the current largest passenger type plus 20 per cent. Coughlan speaks about sand, fine crushed rock, concrete and asphalt with a depth of passion many of us reserve for the sight of a vintage aircraft in flight or the latest prototype rolling off the production line in Seattle or Toulouse. With previous experience as a private pilot, and a work background as an engineer specialising in ports and harbours, he was well placed to not only understand the aviation aspects of what he regards as a “once in a generation” project but also the circumstances that would bring Moreton Bay into play as a key source of the runway underlay. Cue the arrival in 2014 of one of the world’s largest and most modern dredgers, the Charles Darwin, owned by the Jan de Nul Group based in Luxembourg. It spent several months pumping sand on to the runway site from a part of Moreton Bay free of any environmental sensitivity. As an indication of the scope of the task, at one time the dredger was pumping sand along a pipeline for an unprecedented distance just short of nine kilometres. Coughlan recalled how the captain of the Charles Darwin, on his last job after 40 years in dredging, said he was going to retire a happy man because he never believed it possible to pump the distance he pumped at Brisbane. Fast forward to the end of 2017 and joint venture contractor Skyway began the process of skimming off 4.5 million cubic metres of sand no longer required as part of the compaction process. “In the worst parts of the site we predicted up to about three metres of ground settlement and we’ve had just under that. The centre part of the runway we only predicted about half a metre of settlement and we’ve had about 350 to 400 millimetres. So all the ground settlement is complete and there is excess sand to come off,” Coughlan said. Speaking from London where he was fronting a presentation on the project at the Airport Expansion and Improvements Conference, Coughlan spoke of his pride at the success of the reclamation stage and confidence in confronting any future challenges as his team looks forward to the runway really starting to take shape. “One of the things I’m really proud of is that we do a lot of scenario planning. We are continually doing all the risk assessment and scenarios for what could go wrong. Everything is planned out, so if suddenly we find something we will have already contemplated that as a scenario and will implement ‘Plan B’. So it goes very smoothly. Cast ahead to the remainder of 2018 and we are back in the territory of mind-boggling numbers. With machinery in place, paving trials will begin reliant on the blending of fine crushed rock from an initial 100,000 tonne stockpile. Subsequently, a staggering 1.2 million tonnes of fine crushed rock will be required to feed an onsite production line making the different pavement layers and concrete mixtures. The result, according to official BAC statistics, will be 100,000 tonnes of aircraft grade asphalt, mainly for the runway, and 380,000 tonnes of concrete. By November 2018 he believes there will be sufficient visual clues to the new runway to underpin a significant project milestone: the renaming of the existing main runway as 01 Right and 19 Left to negate any pilot confusion. Coughlan explained: “One of the learnings from other airport developments is that when a new parallel runway starts to take shape it can be confusing to a pilot lining up, say, eight to 10 nautical miles out. New runway construction should be complete by the end of 2019 and will be followed by detailed commissioning over about three months to prove the integrity of ground lighting (about 2,000 runway and taxiway lights and 40 kilometres of electrical wiring), navigation aids, and control tower monitoring. 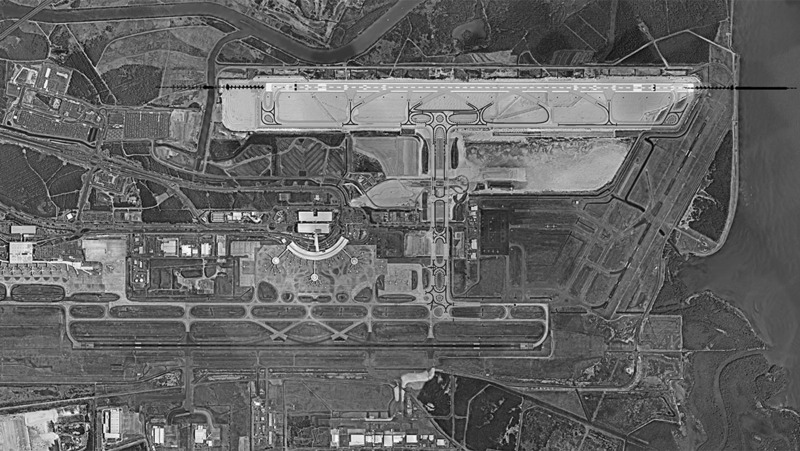 Foresight in the planning of Brisbane Airport in the ’70s and ’80s as a much-needed replacement for the original facility at nearby Eagle Farm included the 360-degree control tower that stands as a significant landmark for anyone approaching the terminals by road. The vision was always for an airport with parallel runways and, according to Coughlan, the control tower fitout included space to duplicate the consoles catering for current airside operations. He says that there will be huge logistical benefit in widely spaced parallel runways (they are two kilometres apart): “They will operate as independent runways. There will be no crossovers in the air so we can do auto-releases for departures, and simultaneous landings,” he said. Noise minimisation has been top of mind within BAC since the project was first mooted and protests emerged over the potential noise effect on residential suburbs outside the current 01/19 footprint. It is quick to point out that the new runway provides a six kilometre straight line buffer between the 01 landside threshold and the nearest residence, more than any other capital city airport in Australia. BAC says its first preference for airport operations is for aircraft to arrive and depart over Moreton Bay via SODPROPS (simultaneous opposite direction parallel runway operations) and DODROPS (dependent opposite direction parallel runway operations). This will be most common at night and at weekends when traffic volumes and weather conditions fit the profile. It says the predominant mode during the day and evening will be 19 and 01 parallel operations with arrivals and departures to/from ports in the north and west using the new runway, and arrivals and departures to/from ports in the south and east continuing to use the existing runway. The arrival of heavy international aircraft on the new 19 Right does throw up the issue of taxi times given the end of the runway will be the furthest possible point from the international terminal and a long way (literally) from the trundle across to the terminal from the current 19 stopping point. Coughlan looks at it this way: “In 01 Left mode you are looking at a taxi time for internationals of around 12 to 15 minutes which is quite normal. When they are in a 19 Right mode they will have about a 20-21 minute taxi. I know a lot of people say that’s a long taxi, but when we benchmarked that against a lot of the major hub airports of the world it was quite normal to see about 20 minutes’ taxiing. It is just short of 90 years since 26,000 people turned out from all over Brisbane to see Charles Kingsford Smith land his Fokker V.II Southern Cross at Eagle Farm at the end of the first trans-Pacific flight. A monument to the achievement of Smith and his crew – Charles Ulm, James Warner and Harry Lyon – stands proudly just off the approach road to today’s Brisbane Airport and just a few hundred metres from that historic landing point. Now more than 20,000 people turn out each day to work in what is a suburb in its own right: the largest airport in Australia by land size covering 2,700 hectares and home to more than 400 businesses, from aircraft and freight handling to warehousing, manufacturing, recreation, tourism and retail, including hotels and Brisbane’s only 24-hour supermarket. That number is forecast to jump to 50,000 by 2029 (passenger numbers are also forecast to increase to 35 million by 2023 and more than double from the current 22 million by 2034). If nothing else it shows that behind the statistics there is a big human story and that goes, too, for the runway project. 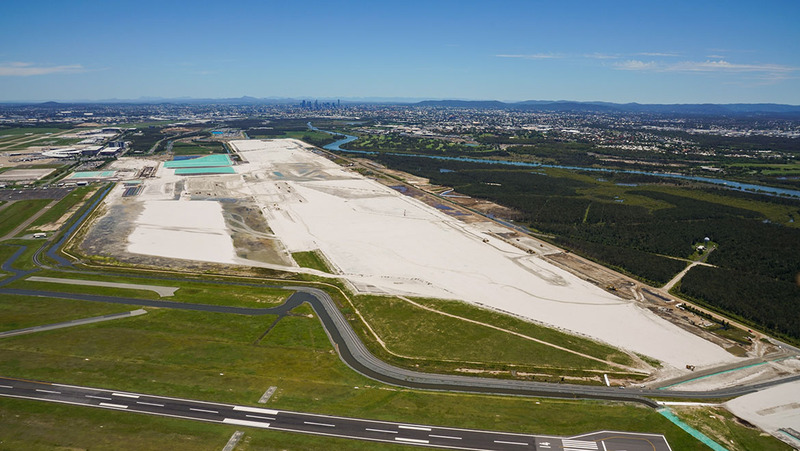 BAC says the runway involves 2,700 construction jobs with a further 7,800 jobs projected for the Brisbane/Moreton region by 2035 due to the increased capacity. Beyond the airport, the development dovetails with major advances in Brisbane tourism infrastructure such as the $3 billion Queens Wharf integrated resort and entertainment hub being built in the CBD on the north side of the Brisbane River. For Coughlan, it all goes to underscore the importance of the runway project. “It’s not just a runway for BAC,” he said. “If you look at developments like Queen’s Wharf and state tourism development, they are all dependent on us having an efficient airport. “It’s a runway for our industry, our state and more than that. This feature story first appeared in the January-February 2018 issue of Australian Aviation. Good on Brisbane. Should help them a lot in the future. One more Australian great project. Next is Western Sydney Airport. Australian comercial aviation keep tradition high!. Is this the runway that was, under the terms of airport privatisation, supposed to have been completed in 2010? Until Kevin07 said that wasn’t any need for it. @Rodney Marinkovic and soon the Melbourne expansion and Perth upgrade in the near future. As long as they make more flight paths to share the love around unlike now with only 2 over the land departure tracks where we get pumbled with planes. I wish BAC could have dreamed a little bigger and built an entirely new midfield terminal of the likes they seem to be mass producing in China. It would be nice if one Australian city had an airport that could match cities like Shenzhen or even Bangkok. I agree Ash. The master plan should have included a combined domestic and international state of the art terminal in the middle of the two runways. So, according to the images, the Drayndra Road underpass is only going to be single lane in either direction. That’s a bit of bad planning and lack of foresight. Ash/David sounds great, but the money has to come from somewhere. Perhaps the international terminal can keep expanding towards the domestic terminal (& vice versa) making them closer together ? How far apart are they now ? I bet there still wont be enough gates at the international Terminal! This is a terminal that ran out of gates the morning it opened for the first time and has been playing catch-up ever since! In the meantime during the construction and settling phase, visibility across the runway is occasionally restricted by blowing sand. Lack of foresight when originally planning BNE regarding placing the International terminal where it is now. Would have made more sense to build it across from the Domestics and joined at the hip. Taxi times for internationals would have been drastically reduced. Frankly having worked out of the airport when it was at Eagle Farm – then transferring to the existing domestic and International airport – I feel was nothing short of a miracle and such forward thinking ‘back in the day’.. We all complained that the airport was out in the bush and it was. The road out to it was new and it seemed to be going to nowhere. Look at it now………..
Good to see they are ditching the cross wind runway, they should get 120 movements an hour from the parallel operations. Mean while Melbourne is planning a second cross wind runway and they anticipate 85-88 movements from three runways. If they go with the proposed fourth runway more cost little benefit. Not sure how they worked out the cost benefit analysis. A second north-south runway and scrapping the existing 27/09 would give at least 100 movements an hour and more if they start building terminals in the central area. Expect some airlines to move to Avalon which with a single runway and a decent approach and tower controller should achieve 60 movements an hour. Dryandra Rd doesn’t see a lot of traffic, the most you’ll see is a few Toll trucks and some spotters heading out in the morning to the ring road.